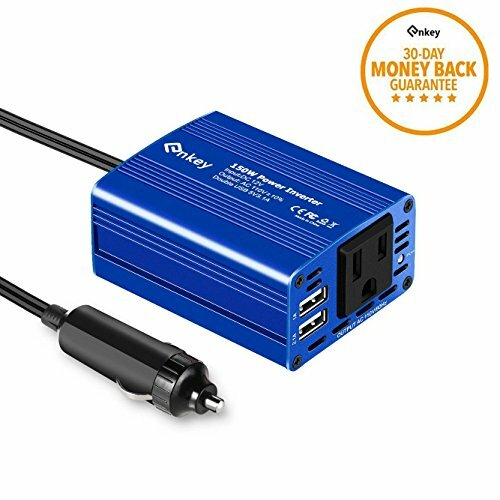 HOW to FIND a GOOD CAR POWER INVERTER for OUR TRAVEL CHARGER COMPANION? Smart cooling fan makes the car power inverter silent when operating, and it runs faster when it gets warmer. Full-protection with short-circuit , low-voltage , over-charge,over-voltage, over-load,over-temperature protection,built-in fuse. Placed random, about 16 inches length cable with cigarette lighter plug since we can reach it to power a laptop in the rear seats. It can be used for camping, outdoors, vacations, road trips, remote job sites, and even charging household items. Dual USB ports effortlessly charge two devices (including any smart phones and tablets) at once while the outlets can power a wide range of power-hungry items on the road. For maximum utility, stay in charge at all times and add this to your travel emergency kit. If you have any questions about this product by Enkey, contact us by completing and submitting the form below. If you are looking for a specif part number, please include it with your message.